Staying Connected is a not for profit organization of volunteers, who are Sun City residents, that serve their neighbors within the gates of Sun City. Commonly referred to as a “Village”, Staying Connected is the vehicle for neighbors to help neighbors stay in their homes as long as it is safe to do so. Staying Connected evolved from a task force led by Holly Field, who now serves as the Chairman of its board. The goal of the task force was to investigate the needs of the community to help resident maintain their active lifestyle. 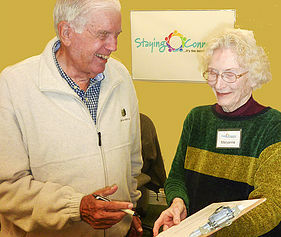 After considerable research and assistance provided by the Coalition for Aging in Place a volunteer service organization was formed. The task force evolved into a steering committee and in June 2014, Staying Connected was established with a five-member Board of Directors. Their Mission: “To enhance resident’s ability to remain engaged within our community and ensure they have access to information and services which provide them with the lifestyle consistent with vision of an active adult community. The mission is supported through the various services offered by Staying Connected such as transportation to and from medical related appointments and grocery shopping, home companionship visits, reassuring call, caregiver relief visits, minor home maintenance and home safety checks. Another valuable asset is their Resource Hub. The Resource Hub is open Monday-Friday from 9:00AM-3:00PM and provides residents with a broad range of Low Country support information. The Resource Hub houses extensive catalogs of medical, social services and support groups that have been researched and organized, saving residents research time and energy. Homes visits and transportation, two of the direct services offered by Staying Connected, have experienced an 83% and 70% increase, respectively, when compared to 4th quarter 2015. Since February 2015, volunteers have completed 96 home maintenance jobs, made 278 home visits, provided 867 round trips (nearly 16,000 miles), and made 1,164 reassuring calls. The Village currently has 350 members and 250 volunteers. Volunteers are at the heart of Staying Connected’s mission. The organization is constantly recruiting volunteers and offers orientation and training for all who are interested. Volunteers are offered the opportunity to work in one or several areas with flexible time commitment. The organization promises that volunteers will have meaningful interactions with their neighbors and will always have more experienced volunteers as their support system. Sun City Hilton Head is humming with excitement. The excitement of residents thrilled with the addition of Staying Connected. Volunteers and members alike are benefiting from the services offered by the community’s “Village”. “As a child I always had a security blanket. Now at 89 years old I have gotten my security blanket back,” …Staying Connected Member. A volunteer simply states “I am paying it forward. I have received help throughout my life and now I am able to help those in need.” Evidence that community outreach changes both lives.